This trash receptacle is great for lining walkways in parks, schools, downtown areas, shopping malls, or anywhere else an attractive trash receptacle is necessary. 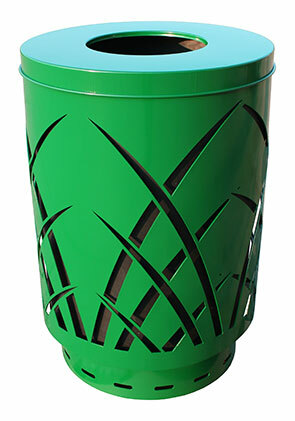 Encourage proper disposal of waste to help keep areas clean, while enhancing the over-all aesthetic with this unique laser-cut-design trash receptacle. With five lid options to choose from, you're sure to meet almost any environments' requirements. Lift off top for easy servicing.